All are truly welcome just as you are! Join us on Sunday mornings for an adult forum at 9 AM, a worship service at 10:15 AM, followed by a time of fellowship and food. We are called into community and a new humanity, based on the love shared by Jesus Christ. We are seekers and servers, listening together for God’s voice in our times. Open to the winds of the Spirit, we invite you to join us on the journey. In our worship we nurture a sense of the sacred and connect the prayers we offer with the ministry we do. We use a bulletin (program) that gives you a road map to what is coming next in the service. We are enthusiastic about sharing “the peace of God” or greeting each other during worship. In our readings and in our prayers, we use language that is inclusive. We draw upon diverse images offered by Scripture to speak about God. We sing a blend of music from around the world and more traditional hymns. A cantor leads the congregation in song. Our choir shares special music often. We love children with us during worship. Activity bags are available in the back of the sanctuary for children to use. There is a Parent’s Room off the sanctuary where families can listen to the service and be with their children. We also provide a nursery with staff and volunteer attendants for children age 3 months through first grade. The CPUC community is reflective of the diversity of our world. All are welcome to fully participate in the worship life and programs of our church. We typically celebrate the sacrament of communion on the first Sunday of each month. Everyone is welcome at our table. God doesn’t discriminate, and neither do we. You are welcome to come as you are. We care about seeing you and not what you’re wearing. Food is an important part of the life of the church. After service each Sunday, we host a time of fellowship in our social hall. Typically snacks, coffee, and juice are available. We are handicapped accessible. The ramp/sidewalk on the Manomin Street side of the building leads to the handicapped entrance. Inside the automated door is the lift. The lift goes to both the sanctuary level and the social hall level of the building. Hanicapped parking spaces are located on Manomin Street as well. Our restrooms are all gender. Diaper changing stations are in all restrooms. If and when you are interested in joining Cherokee Park United Church, please let the pastor or a church Council member know. People are asked to participate in an Inquirer’s Class to learn about the church, its ministries, policies, and relationships to our wider denominations. These classes are held when several people are interested in joining. Church membership means you can vote at congregational meetings and can serve communion, if willing. Youth become members when they are confirmed. 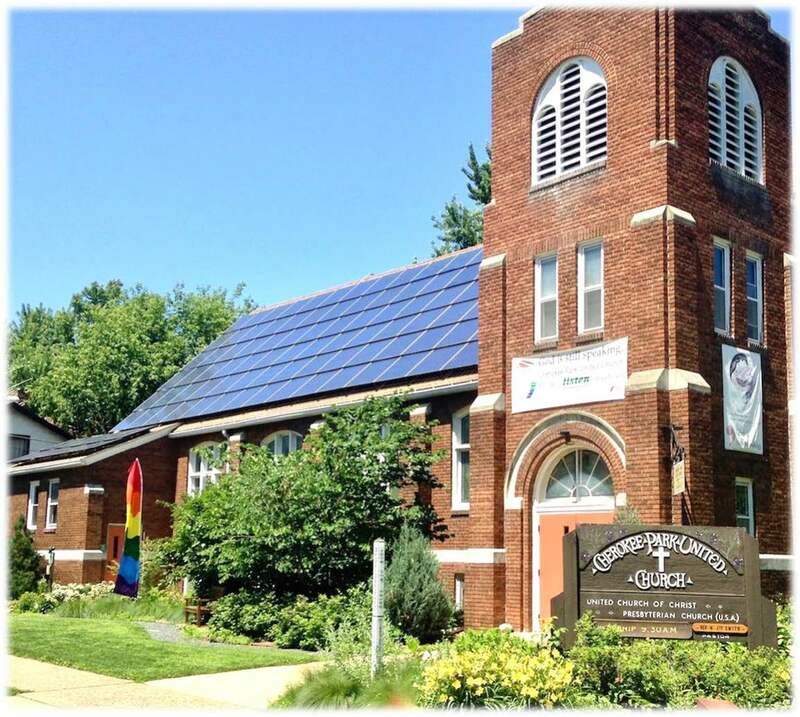 Our colorful congregation participates in many community events on the West Side of St. Paul. Our welcoming float and puppet-carrying marchers join in the annual Cinco de Mayo Parade. We host a National Night Out event with our neighbors the first Tuesday in August. We sponsor community video nights and other programs (art shows, music concerts, etc.) where all are welcome. We partner with many neighborhood organizations including West Side Community Organization and West Siders for Strong Schools. Cherokee Park United often shares its space with local non-profit groups looking for a venue.